Vegetarianism and veganism seem to be everywhere at the moment. You’ve tried to ignore it, but at the back of your mind, you can’t help but feel swept up in it. Netflix is full of documentaries about the benefits of eating less meat, be it for environmental, health or animal welfare reasons, and once you’ve seen a couple of these docs, you might have decided you’d like to attempt to cut down on eating meat, but aren’t sure where to start. 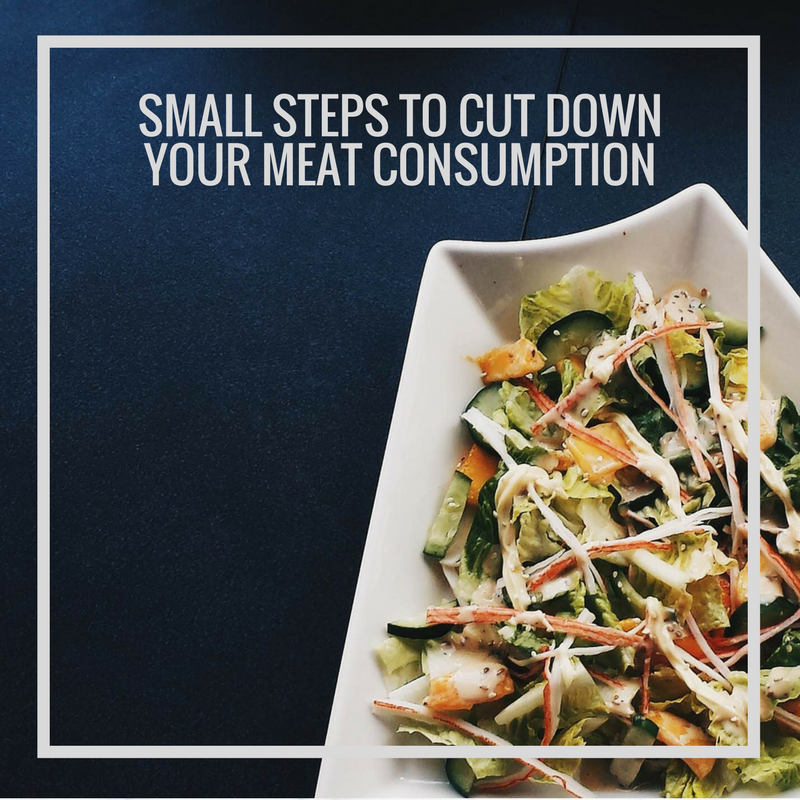 Statistics indicate that even just cutting down on meat is not only better for the animals involved, but also lowers your risk of some cancers and heart disease, to name a few things. Farming animals for food is also attributed to causing much of climate change. But could you really go vegetarian? What about at Thanksgiving and Christmas? Will your friends think you’re crazy? Will your parents-in-law think you’re just being difficult? Going full vegetarian straight away might seem like an overwhelmingly big leap for a life-long meat-eater, but there are some simple ways that you can start to cut down on meat, and perhaps even go totally meat-free (if you want to!) Many of us feel the pressure of the word ‘vegetarian’ or ‘vegan’ as a label that is like a binding contract with no flexibility. That’s probably why there are so many new words to describe those that aren’t totally meat free, but are trying to do their bit in different ways, like the climatarian, flexitarian or reducetarian. Whichever route you want to go down, remember that what you eat is your choice! Like with any new habits, planning ahead is important to make sure you’re not caught out. If you’ve decided on a meat free day, make sure you’ve had a think about what meals you’re going to be eating that day and maybe even take food with you if you think you might struggle to find something on the go. If you’re going out for dinner, taking a look at the meat-free options on the online menu in advance could prevent a slip-up later on. As a meat-eater, you may not have given much thought to veggie options, but they can be quite limited and even non-existent in many restaurants. There are more and more companies out there making meat-free alternatives. The idea of eating fake chicken might not sound too appealing, but you’ll probably be surprised at some of the likenesses. Continuing to eat the same meals you ate as a meat-eater with replacement meat is probably not a good way to go in the long-term, but could be a great way to make the transition in those early days. Use the diet change to explore different meals and learn new things! When the majority of your meals in the past have had meat as the main component, it can be difficult thinking of meat-free recipes. Luckily there are tons of recipes out there you can try out that are absolutely delicious, and apps can be a great way of finding them. Be as adventurous as you like, and take the time to learn how different vegetables behave when they’re cooked. It might be a good idea to get used to a few easy recipes that can be made quite quickly on weeknights or when you’re pressed for time, like pasta dishes or pizzas. You don’t need to dive in and start cooking your own seitan, throwing out all the meat in your freezer and changing all your milk products to dairy-free alternatives. This may work for some people, but for most, it’ll be easier to take small steps and you’ll be more likely to stick to it. You might want to gradually reduce the types of meats you eat, like no lamb, then no pork, no beef and so on, rather than changing everything at once. Once you’ve got into a habit, you’ll find it gets easier and easier, and you can make more changes along the way when you’re ready. Likelihood is you WILL turn up at a meat-only restaurant without thinking, you WILL accidentally eat those gelatine sweets you like, and you WILL eat prawn crackers that come with your otherwise veggie Chinese takeaway. It happens. And when it does, it doesn’t mean you’ve failed. You might decide you don’t care that day and eat the meat anyway, you might decide to give the rest of your sweets away, you might not even notice. Don’t worry! The fact that you’re thinking about what you’re eating is probably a good thing, whether you decide to reduce your meat or not. Good luck on your meat-free adventures! Guest post was written by Laura Hall at Shiply. Learn more about guest post contributions.